This is my new Del-Ton Echo 316H. I set it up with a Primary Arms Advanced Micro Dot sight on a Fortis F1 mount. I really like this rifle! Last edited by PennsylvaniaRifleman on Sat Jun 24, 2017 8:38 pm, edited 1 time in total. Nice rifle, I had a Del-Ton built from one of their kits. Always ran good and was accurate. Thanks guys! Yes, I've also read that Primary Arms uses the same source as Holosun, but with some specs changed at their request. One that I like is the lack of an auto-off feature, as the battery reportedly has a 50,000 hour life on the medium setting (more than 5 years). I like the "always on" option, and haven't turned it off since I got it for Father's Day. I'll check in with updates from time to time. For the record, I didn't change the factory battery. What kind of BUIS is that? How has the microdot worked for you so far? The back-up sight is a Magpul MBUS. I'm liking the Microdot--still getting used to the idiosyncrasies of using a red-dot, keeping both eyes open etc. Below is a group typical of today's session using 62 gr green tips--about 3 inches. This is from the bench at 100 yards. I have a 50/200 zero so expect to be a bit high at 100. I was doing a bit better with the A2 sights on the detachable carrying handle, but I didn't buy the red dot for precision. The light, as well as the single point sling, was a nod towards having this rifle similar to the rifle set-up I have at work (I'm an LEO). At the risk of being seen as overly tacticool, it is nice to have a mount for my Streamlight TLR. It's a Kley-Zion bayonet lug mount from Botach. Simple install and was $15 on sale. I like it. I only mention the light because they can be a useful tool, or a terrible liability. First, I am not saying you are wrong here, and as long as you like it then by all means go for it.... and second, I believe any home defense weapon should have a light. Any item that can help you identify a target at 3 a.m., half asleep, and in the dark is a huge plus especially when there is no room for any mistakes. As you may have guessed by now I do not use my AR 15 for home defense or indoor practice, primarily because I have children in other rooms and neighbors (that I like) that live with relatively close proximity. Thus, none of my AR's have lights on them for that reason because I believe that if I fire it indoors it will not only "open a can" on the guy, but also on everything else behind them including objects outside I do not want to hit. For anything indoors, and at night I practice with shotgun or pistol for those instances. As far as liability goes, I have read that lights are a no-no when outdoors also. I would imagine that at night, a light shining in the darkness is a large shiny target for all to see. Thus, I have never seen the need for a light on an AR, or any rifle. Points well-taken Ozzman. I agree that white lights, like lasers, "work in both directions," and that anything longer than a momentary flash while on the move is a recipe for trouble. That said, I do enjoy having it as an option to assist with target recognition if needed, either outdoors or in. I'm with you regarding the merits, or lack thereof, for home defense applications. That's not the role I have intended for this. My first choice is a handgun. I will say that this carbine is making me rethink my position on the usefulness of my 870 (shown with it below). This little rifle handles so much easier. Target acquisition in low/no light is so much better. Precise follow-up shots are so much quicker...I'm really at a loss to think of a situation where I would choose to pick up the shotgun instead....did I make my 870 obsolete? How do you like Delton. I've seen mixed reviews, the majority being good, but i have no first hand experience. Can't please them all I guess. I was looking at doing a retro build with one, but the A2 style uppers were always sold out when I was ready to do it. Finally found a A2 style AR15 at a gun show already completely built, done by Bushmaster. Still thinking of getting a Delton and doing another A2 build if I can ever find their A2 uppers. Speaking only for myself, I've had very good experiences with Del-Ton. Prices are good and quality has been excellent on everything they've sent me. I mentioned in a previous thread that after building an A1 retro rifle I had to replicate it for several other geezers of my age group. One of the hardest things to find is the A1 profile "pencil" barrel. Del-Ton is one of the few manufacturers of an A1 barrel and they use a 1-in-9 twist. Not period correct but it does allow you to shoot 62 grain ammo without worrying about accuracy issues. All my friends have been very impressed with the accuracy of Del-Ton barrels. Most of us don't shoot with iron sights beyond 300 meters any more due to aging eyes, but within this range Del-Ton barrel accuracy is excellent. While I've used other Del-Ton parts in smaller quantities with no issues, most of my experience comes from installing and shooting their barrels, and they make good barrels IMHO. I had no interest in AR's but when Obummer won in 2008 I thought I better buy one. Bought a Delton M4, 1-9 twist chrome bore. It grouped 1' - 1.2" at 100 yards with LC XM193 55 gr, about the same with any other brand .223 or 5.56 55 grain ammo, and nearly that with steel cased Russian ammo. This was from a bench with a 1970's Weaver 3-9x scope. Pretty darned impressive. I wanted more accuracy as my buddy had a P.O.F. that grouped .56" at 100 yards. 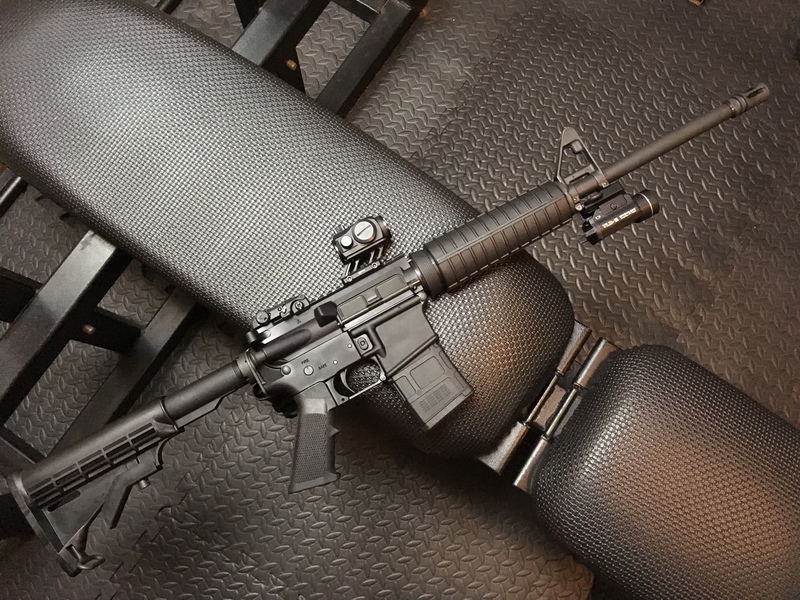 I bought a DPMS 20" stainless bull barrel 1-8 twist upper and I built a PSA lower and added a Giselle trigger. It patterned rather than grouped with every brand of 55 grain ammo I tried... 5" at 100 yards. Pitiful. I finally tried high priced match ammo and got .75" groups, but I was not gonna pay $1+ per round so I sold it. More recently I decided to try again for a tack driver. I bought a PSA 416R stainless 1-8 twist upper with free float hand guard. It also patterned rather than grouped. 8 -10" at 100 yards with any ammo I tried. I sent it back to PSA and they replaced the barrel. It then would shoot 1.1" groups on a good day with some brands of 55 grain ammo and 3" with other brands. I fired the Delton and PSA side by side and the Delton always won with any ammo. As time went on the Delton groups got even tighter, but the PSA groups remained the same. I sold the PSA upper. Since then I installed a 14x Simmons ATV scope on the Delton. With continued use the accuracy has improved even more. It has a chrome bore so I don't know why accuracy improved with use. I have heard 1-8 twist is fine to stabilize 55 grain ammo but the 1-8 DPMS and PSA uppers I've had leave me wondering. I also wonder if PSA barrels are "seconds" with defects as 2 friends have had poor accuracy issues with PSA uppers also. The photos below are recent using the afore mentioned 14X Simmons ATV scope atop my Delton M4. Russian ammo always has 1 flier to ruin a good 5 round group. It would have been about 1.9" were it not for the flier. (Steel cased ammo also had failure to extract issues until I roughed up the chamber with 280 grit sand paper. It's now 100% reliable.) Lake City XM193 routinely groups 1" or less as does PMC Bronze .223. The group below is .85" and that's with original M4 hand guards and a $10 JP reduced power spring set only. My rifle is from 2008, and I can't speak to current quality control, but assuming quality has remained consistent I'd buy another Delton if I was in the market for another AR15. BTW, I love that SP-1. The triangular hand guards made them look so sleek. I've considered building a modern 20" A2 but with surplus triangular hand guards. I've considered building a modern 20" A2 but with surplus triangular hand guards. I would advise you to at least pick up the triangular handguards sooner rather than later as they are not terribly expensive. They're beginning to become hard to find. Three or four years ago I could still find them new surplus in the wrap but now all I seem to find are used ones, many of which look pretty beat. Forgive me if I'm telling you something you already know, but to me one of the "cool" factors of the triangular handguards is the retainer at the rear that pre-dates the advent of the delta ring. Look at Penn. Rifleman's right side photos in post #9 above. His SP1 has the early handguard retainer and his M4 has the delta ring. Those early handguard retainers are harder to find than the triangular handguards, FWIW, and of course ( unlike the handguards) you have to unscrew and remove the barrel if you want to replace a delta ring, so look for the early retainer ring while seeking out triangular handguards if you want that really early look.